Generation C (Gen1) standard long taper magnum with 5 needle count. Found useful for lining, shading and color packing of smaller areas. The long taper magnum configurations are available with 5, 7, 9, 11, 13 and 15 needle points. T-Tech long taper magnums are weaved by way of a flat needle to allow for better ink dispersion while tattooing. Long Taper Magnums are #12 (0.35mm) in diameter with a 3.5mm long taper. 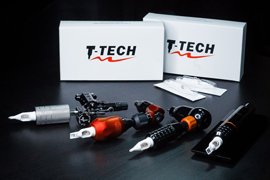 T-Tech long taper magnums and are great to cover large areas for tattooing, shading medium and large areas, as well as blending. Each box contains 20 individually packaged needle cartridges of your chosen long taper magnums configuration. All cartridges are EO sterilized and individually packaged.